Allergy Standards has been recognized as a leading innovator among Irish companies investing and operating in the US. As a result, several members of ASL’s leadership team will be attending high-level meetings in Boston, New York City, and Washington D.C. to strengthen the company’s economic ties between the US and Ireland. Science Foundation Ireland (SFI) held a St. Patrick’s Day Medals Ceremony at the Massachusetts Institute of Technology (MIT) in Cambridge, MA hosted by Professor Mark Ferguson, Director General of SFI and Chief Scientific Adviser to the Government of Ireland. Dr. John McKeon, CEO of ASL, and Dave Morrissey, CIO of ASL, were invited as special guests, an honor bestowed upon leaders of Irish companies with significant contributions to the life-sciences sector. Allergy Standards’ CEO, Dr. John McKeon, announced the Amber Tringale Memorial Award alongside Kenneth Mendez, CEO of the Asthma and Allergy Foundation of America (AAFA), at the Global Ireland Lunch in Boston. Witnessed at the event by the Consul General of Ireland, Finnoula Quinlan, SFI, and Ireland’s Minister for the Environment, Richard Bruton, this travel award will be an annual fund awarded by ASL and AAFA to help facilitate cross-border dialogue and research into the prevention of asthma and allergies. For the 9th annual Ireland Day at the New York Stock Exchange (NYSE), Courtney Sunna, ASL’s VP of Strategic Business Development, gathered with key C-suite business and political leaders from Ireland and the US into the NYSE Freedom Hall, where they were welcomed by John Tuttle, Chief Operating Officer of NYSE Group and Chargé d’Affaires to the US Embassy in Ireland, Reece Smyth. 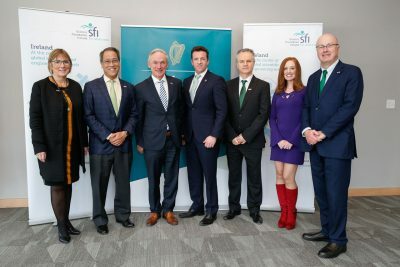 At this event, it was announced that ASL was recognized on the release of the 2019 Ireland INC US 250, an index of the 250 Irish companies investing and operating in the US. A panel was held with Congressman Richard Neal, Former Irish Ambassador to the U.S. Anne Anderson, and Former US Ambassador to Ireland Kevin O’Malley to discuss and investigate the challenges and opportunities presented by Brexit to both Ireland and the US. Courtney Sunna and Dave Morrissey have also been invited to a celebration of St. Patrick’s Day with the senior leadership team of Bank of Ireland, hosted by the CEO of Bank of Ireland, Francesca McDonagh, as well as a St. Patrick’s Day Reception at the United Nations with Ambassador Geraldine Byrne-Nason, Ireland’s Ambassador to the UN, and Charles Flanagan, Irish Minister for Justice and Equality. The ASL team is honored to be part of these prestigious events and being recognized as an industry leader in helping to improve lives of people impacted by asthma and allergies. Healthcare innovation, US-Ireland, life science, allergy insights, environment.